November 29, 2018 – There aren’t many major archeological events that have become part of the collective memory of the Western intellectual like the discovery of Pharaoh Tutankhamun’s tomb. This is not just due to the impressive number of objects found, but also to the fact that this excavation was the first one to be well-marketed in the media. The financial backer of the excavation, the Earl of Carnarvon, had signed an exclusive contract with The Times, reserving all rights to the publication of the finds to what at the time could be considered the most important British newspaper. All other media whishing to keep their readers up to date on the goings-on in Egypt were forced to purchase the official press photos from The Times. Christina Riggs (with Rupert Wace), Tutankhamun. The Original Photographs. Rupert Wace Ancient Art, London 2018. 112 p. Black-and-white images. Paperback. 29.6 x 24.4 cm. ISBN: 978-0-9575064-4-2. GBP 25 plus shipping. As irritating as this procedure may have been for the international and especially the local Egyptian press, it is to this that we owe the spectacular find of 148 photographs taken by Harry Burton, the photographer of the Metropolitan Museum of Art, on behalf of The Times. The collection of photos was rediscovered and is now being published by Rupert Wace, an art dealer specializing in Egyptian antiques. He secured the support from Christina Riggs, who knowledgably presents the beholder with the political and historical background to all these pictures. Thus, this elaborately-designed catalog is not just something for people of the visual type who are interested in “King Tut”; it is so much more. A high-level testimony of the history of archeology and its exploitation for political purposes. But also a testimony of the innocence with which the British as representatives of the Western world viewed their superiority as self-evident. As a preface to the book, Ms. Riggs sets a picture showing an Egyptian excavation helper in a traditional robe, using the telephone the authorities had installed – a photo that captures a lot of that Western hubris. Which in fact was natural in 1922, considered nothing out of the ordinary, let alone reprehensible; it was simply unquestioned communis opinio. Of course, apart from all the historical aspects, the book is aesthetically pleasing. The photographs reflect the photographer’s skill, who knew precisely how to construct a good image. To the readers of The Times, they provided a look into daily life at the excavation site, showing exciting moments over the course of the excavation as well as the illustrious visitors in the Valley of the Kings. They present the prettiest objects and give carefully-arranged insights into the burial chamber. If you would like to get an image of how an excavation was done in 1922, you must buy this beautiful book. “Tutankhamun. The Original Photographs” is a valuable addition to every library; reading it imparts loads of information in a low-threshold manner. The catalog of photographs is a hymn on the love of Egyptology, while at the same reminding us of respecting the descendants of the former pharaohs. It provides insight into the young nation of Egypt and the excavation techniques of the early 20th century. It is fascinating and impressive, and an adequate appraisal of what must be the most famous excavation in the entire history of archeology. You can order the catalog on this website. Christina Rigg curated an exhibition in Cambridge, on which the BBC reported extensively. 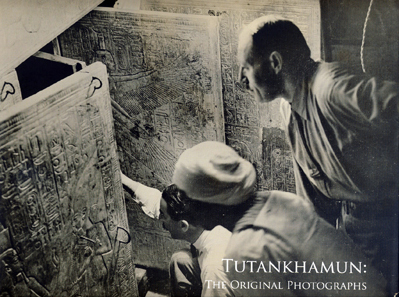 Tutankhamun is still more of a media event than a scientific subject, which is illustrated by the official trailer to the exhibition.